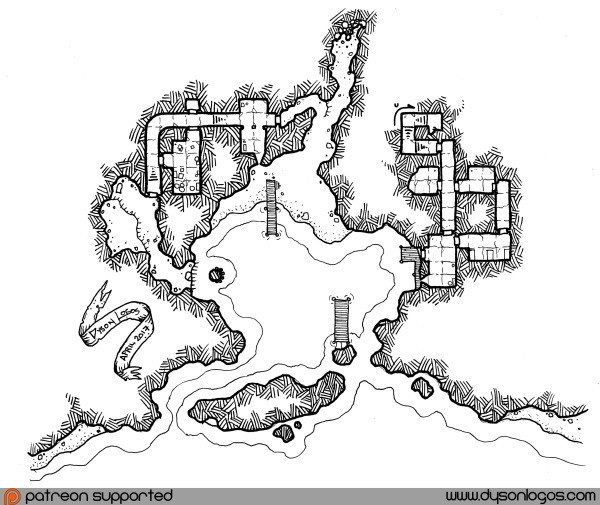 Tenkar's Tavern: Which Dyson Map Do I Use for the October Adventure Funded by the Tavern's Readers? 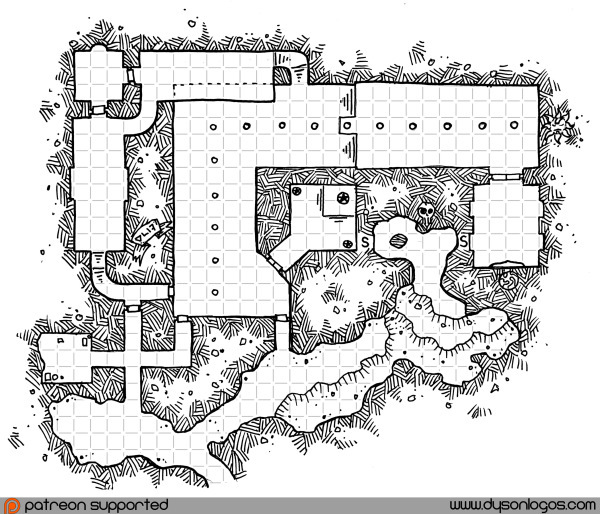 Which Dyson Map Do I Use for the October Adventure Funded by the Tavern's Readers? I'll be posting four +Dyson Logos maps below. I'd like you, the reader, to pick a map and tell me why you'd like that one written up for October's adventure. Your input will help decide the direction of the adventure. I choose Serzen's Seven Stairs. That just looks so cool. Pirate's Cave. Those stairs on the right hint at further adventures beyond the cave. 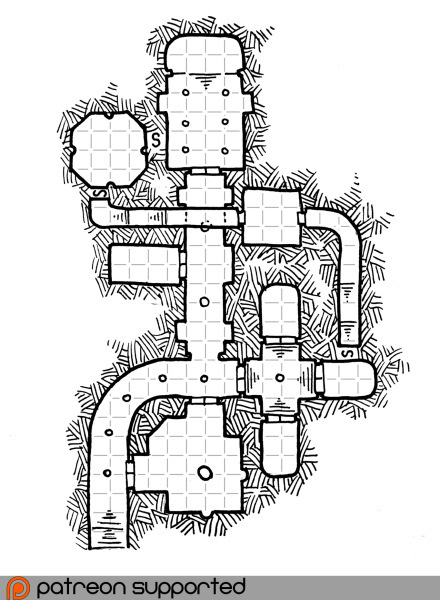 Serzen's seven stairs, Because what is a tree doing in a dungeon? My favorite Dyson map. Use that one. Takes alot of balls though. Jason - the "Alberts Prints" map isn't a commercially licensed one, so that's out unless Erik wants to license it. Personally I have a love affair with my hand drawn gridding style, so I prefer the Pirate map. 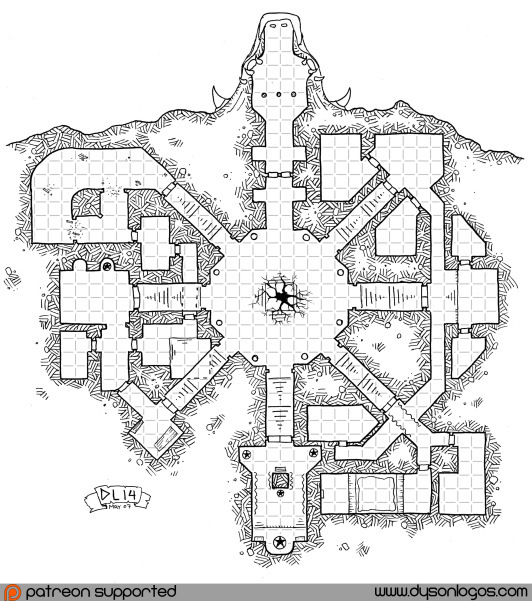 But SOMEONE needs to do something cool with Serzen's Seven Stairs because it is such a "crazy fantasy dungeon" style map. Serzen's Seven Stairs! Reminds me of the Marmorial Tomb map a little. Crypt of the Scarlet Wolf as I am curious to know what/who the Scarlet Wolf is. Serzen's Seven Stairs - I think all the maps are good, that one is great especially if it begins by being lowered into the center chamber as a treasure hunting or dungeon raiding expedition.